Go to the Bookings menu, then change the view to "List" view. You'll see a grid of all your bookings. You can sort, page and filter the grid. Under each column header, there is a filter option. Look for the filter option under the Total column. Click that filter and change it to Any Status or Only Canceled. That will show you a list that includes canceled bookings. Todd, you can also find canceled bookings under the general search as well. If you know the name (or any part of it) enter it up top in the search box. That returns all records that match and shows a "[CANCELED]" indicator on any that are canceled. Just wondering if there is updated info on cancelled bookings. Thank you! Yep! 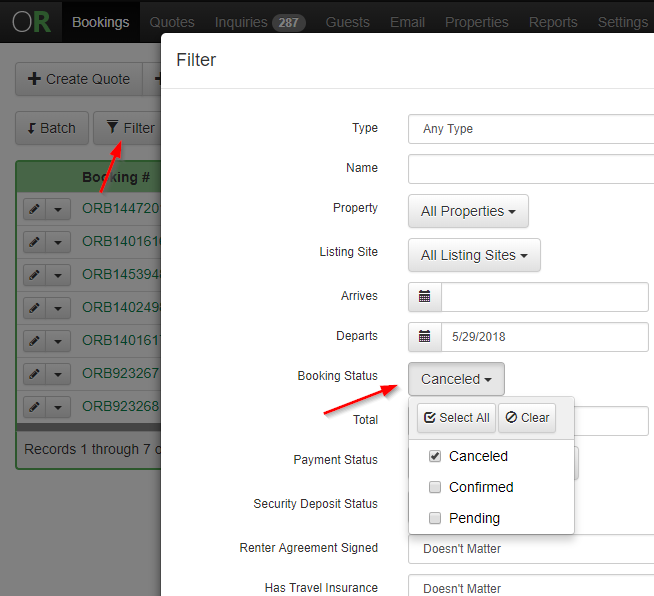 You can still filter for canceled bookings in the list view, but the way you filter has changed a bit from the last post. To change a filter, click the Filter button. Then filter booking status to show canceled.